From the factory, it’s likely your Mac is running potentially slower than it could be by booting in 32-bit kernel. Possibly Apple does this for maximum compatibility. However, with the potential to run some applications up to 30% faster, it’s worth looking into. 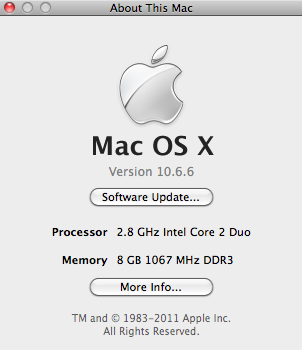 As of this posting, the only Mac shipping with the 64-bit kernel as default is the mid-2010 Mac Pro . You can startup in 64-bit kernel on an as-needed basis (without setting it to always startup in that mode), by simply holding “6” and “4” keys together before the Mac chimes. If you’d like to change it to always startup in 64-bit kernel, Apple has posted instructions here (it’s dead easy). 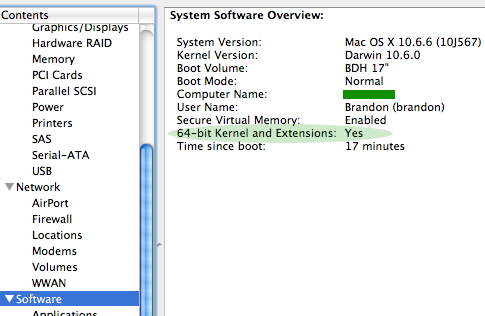 If you want to double check if your Mac is currently running 64-bit kernel. Simply click on the apple icon in the top left of your screen, and click on “About This Mac”. “Should you boot into the 64-bit kernel? Tests of photographic applications show that the gains of booting with the 64-bit kernel can be substantial, keeping in mind that a 30% gain via hardware often costs several thousand dollars more. Why not get a good chunk of that for about $25? Your 64-bit programs (if any) will run fine on a 32-bit kernel, gaining the benefits of 64-bit-ness. But they won’t see full performance that way. I’ve set mine to 64-bit kernel and have noticed nothing incompatible yet. Give it a try! I never knew this – thx!